Live Your Art: Happy Earth Day! I love to reuse fabric! Old clothes, table cloths, curtains, sheets can not only be repurposed, but existing seams and trims can be utilized to cut down on sewing time! 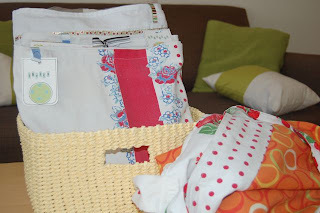 The tote bag and scrapbook storage bags were made from vintage table cloths and scrap material. 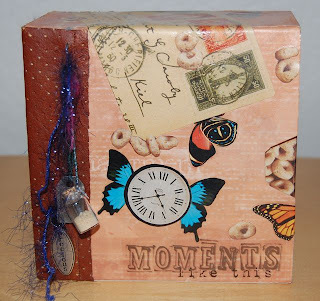 This slip case and scrapbook were made from my first iPod box. The decorations from Max's birthday party are now bedroom decor. Due to both frugality and philosophy, I've challenged myself and the kids to see how green we can be this summer. Today Max planted the container vegetable garden he received for his birthday (he loves to garden!) Compost bins and solar ovens dance in my head - let's see if they end up in my backyard! Hi Casey! I love that you use all those old fabrics/scraps to create something new and beautiful! And your iPod box totally rocks!!! 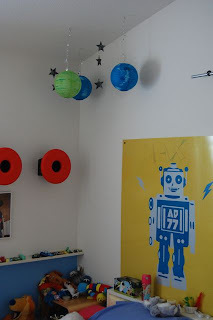 Max's birthday decs look great in his room! Cudos to you for doing what you can to "go green". Fun post today!! Thanks for sharing it all! You brightened my day! I'm impressed. :) I'm out of work right now, so frugal = GOOD around here, too. I'm not crafty, though, so I don't know that I'll be redoing my iPod box.